Cross-posted on my personal blog. The adjoining regions of southeastern Turkey, northern Syria and northern Iraq—in which my dissertation research is focused—share a rich musical tradition of lamentations within a genre known in Turkish as the uzun hava: long, winding melodic meditations on suffering and loss that express pain as a heartfelt wail of mourning that nevertheless remains beautiful. This musical tradition has never been more apt than in 2015 when the Islamic State (better known under the acronyms ISIS, ISIL or, as used here, Daesh) systematically targeted the region’s cultural heritage sites for destruction and broadcast their actions globally as a form of promotional propaganda. Archaeological sites that were first excavated in the 1870s such as the Assyrian cities of Nimrud and Nineveh, the Mosul Museum and more recent religious shrines from both the Muslim and Syriac Christian traditions have all been looted, severely damaged or destroyed. Given these recent events, I found myself faced with a challenge during the Fall 2015 semester: how do you engage students in an emotionally wrenching topic…particularly when the subjects of study stand a decent chance of being destroyed before your eyes during the semester? How do you teach a class focused on the archaeology of a region where—just before the beginning of the semester—the elderly archaeologist of Palmyra Khaled al-Asaad was publicly beheaded by Daesh; how can you best honor his memory and the memory of all the other lives lost in the current regional conflict? Should the on-going destruction even be discussed in a class focused on the ancient world, and, if so, how? These were the questions I faced while re-writing the syllabus for my Fall 2015 Archaeology of the Middle East class. I discovered that destruction of memory is one of the key themes underlying these acts—and the one that ultimately provided a lifeline for my class. While planning my syllabus I encountered the “Material Speculation” project of artist Morehshin Allahyari. Ms. Allahyari’s creative and insightful approach to the topic uses photogrammetry—reconstructed 3D scans of photos and objects—as well as 3D printing to reproduce artifacts destroyed by Daesh in the Mosul Museum and at archaeological sites like Palmyra, Hatra, Nineveh and Nimrud. Each 3D printed reproduction is embedded with a memory card that contains information about the original context of the artifact. In an ironic and clever twist, Ms. Allahyari notes that the plastic from which each new reproduction is printed is a petroleum product and that control of petroleum resources is one of the main sources of conflict in the region. (It’s worth noting that the PLA—Polylactic Acid—plastic that is used in many small-scale 3D printers is eco-friendly and made of cornstarch.) Ms. Allahyari plans to make public the materials necessary for anyone who can gain access to a 3D printer to create, re-create and remember the lost cultural heritage of Syria and Iraq; she posted her first public plan in February 2016. With “Material Speculation” the artifacts destroyed by Daesh are detached from their original material boundaries; they become infinitely reproducible, capable of being distributed globally and accessed across cultural, linguistic and economic strata. In an age of refugees, the destroyed art itself has become detached from its homeland. Printing is an empowering but also peaceful response to violent acts of intolerance. Peyton Fitzgerald and Emilie Gregory learn how to use the printing software. Ms. Allahyari’s work inspired me to incorporate a 3D printing project into my class. At the end of the semester—by which time, I grimly assumed, more sites would probably have been destroyed by Daesh—student “excavation teams” would each be responsible for printing objects from a specific damaged site and would present an “excavation report” in the style of a conference paper describing its history and damage. How were we going to do the 3D printing, though? Although I am a doctoral candidate in the University of Virignia’s Department of Anthropology—working with Pati Wattenmaker at the UVA excavations at Kazane Höyük in Şanlıiurfa, Turkey, 30 miles from the Syrian border post at Akçakale/Sabi Abyad—I was teaching my Archaeology of the Middle East class as an adjunct instructor at James Madison University in Harrisonburg. This presented a unique opportunity to observe the pedagogical benefits and problems associated with two very different ways of incorporating 3D printing into student life as well as two different 3D printing labs: UVA’s Makerspace in Alderman Library’s Scholar’s Lab and James Madison University’s 3SPACE Lab, each of which generously contributed to my efforts. I realized throughout the semester that each school’s 3D printing approach has its benefits and challenges. 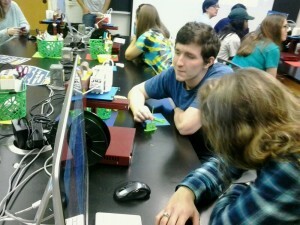 At both schools 3D printers are located in a number of different nodes around their respective campuses—most notably, in their engineering schools, their health sciences departments and in a facility accessible to undergraduate College of Arts and Sciences (UVA) or General Education (JMU) students. There is no single resource at either school for finding out where 3D printers are located, to whom they are accessible or how to access them. Front row: Dominic Traver, Alexandra Bowen, Brianna McDonald, Samantha Hill and Megan Walmsley plan their printing projects; back left, standing Center for Instructional Technology Instructional Designer Jamie Calcagno-Roach trains Emilie Gregory and Peyton Fitzgerald how to use the printing software. 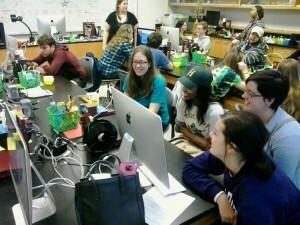 Also pictured, Hannah Sullivan, Chris Molloy, Carlisa Childress and Colton Wells talking about their printing plans. The accessibility and security of the 3D printers are approached very differently at UVA and JMU. At UVA, the most easily-accessible printers are located in the Alderman Library Scholar’s Lab Makerspace under the wider umbrella of the Digital Humanities. Because it is part of a publically-accessible research library, the Makerspace ethos encourages casual experimentation and creativity. It is accessible for drop-in users or by appointment as part of the regular services provided by the library. At the moment, it contains one Ultimaker and 2 Makerbot printers (with more varieties on the way) and individuals using them can book printers for multiple days to print if needed. (This is useful because complex 3D printing projects can take a day or more to print fully.) All 3D printers at the current stage in their technological development are glitchy; being able to monitor whether they’re working and fix printing errors or problems encourages a successful print. One of the wildly knowledgeable and friendly Makerspace staff members is always present to answer questions and fix the machines if necessary. The open access to the Makerspace means that students can drop by at their convenience between 1:00 and 5:00 (or by appointment at other times). By contrast, JMU’s printing lab—located in Burruss Hall in the center of campus—is locked when not in use and is only accessible during scheduled classes, by special appointment when an attendant is present or during 3D printing club weekend hours. This is partly a product of security concerns due to the number of computers and printers present in the room. It is also a product of safety concerns, because printer users are required to be formally trained by someone who can inform them of the hazards associated with the machines (like the very hot printing tips). Unlike the Makerspace, JMU’s printing lab is designed for entire classes of students to use the printers simultaneously in a classroom setting; it includes nine Apple computers attached to Affinia printers and another printer for more detailed varieties of printing. (My class really had the maximum number of people possible present in the lab with 3-4 students at each printer for our training session.) All users must receive at least one class session of formal training in machine function and safety before using the printers. This classroom space can accommodate a larger number of students at the same time than the Makerspace is able to handle; however, printing projects can only be created during the hours when the lab is open. This limits users to projects that can be printed in an hour or two unless someone is available to unlock the lab at a later time. The amount of PLA printing filament used in the 3SPACE lab is also more tightly controlled than the Makerspace; students are required to weigh their projects and report the weight of the plastic used after each session so that the cost of supplies can be accounted for due, in part, to the higher volume of students using the machines. Large or detailed individual projects that aren’t for specific classroom purposes might involve a fee; semester-long classes in the lab include a lab materials fee for spools of PLA filament. Front to back on right: David Szady, Ximena Calvo and Catherine Grimes wait for their first prints to start in the JMU 3SPACE Lab. From a pedagogical perspective, the differences between these print labs presented both opportunities and challenges—and I made a number of very significant mistakes of my own along the way. Chief among the latter was the assumption when I designed the course syllabus that students would have easy access outside of classroom hours to JMU’s 3SPACE printers in order to print their projects, particularly if the individual object was complicated and would take a long time to print. I incorrectly assumed that they had the same relatively open-access policy that the UVA Makerspace applied to its printers. This meant that I had to schedule extra hours—as it turned out, on a Sunday—for the students to print their group projects. I also had to scale down the requirements for the final group printing project as a result. The size of my class and its need for extended formal training were also issues that I should have anticipated through better coordination with the friendly and helpful people at JMU’s very interesting and supportive Center for Instructional Technology and the Institute for Visual Studies and Math, which run the 3SPACE Lab collaboratively. I am grateful for the patience, enthusiasm and dedication of the staff members in both the Center for Instructional Technology and in the Scholar’s Lab, especially Jamie Calcagno-Roach, Jennifer Grayburn and Shane Lin. 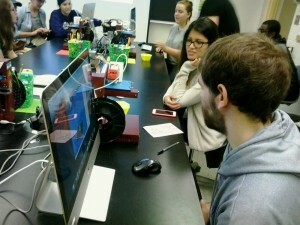 From the students’ perspectives, how did the 3D printing project turn out? 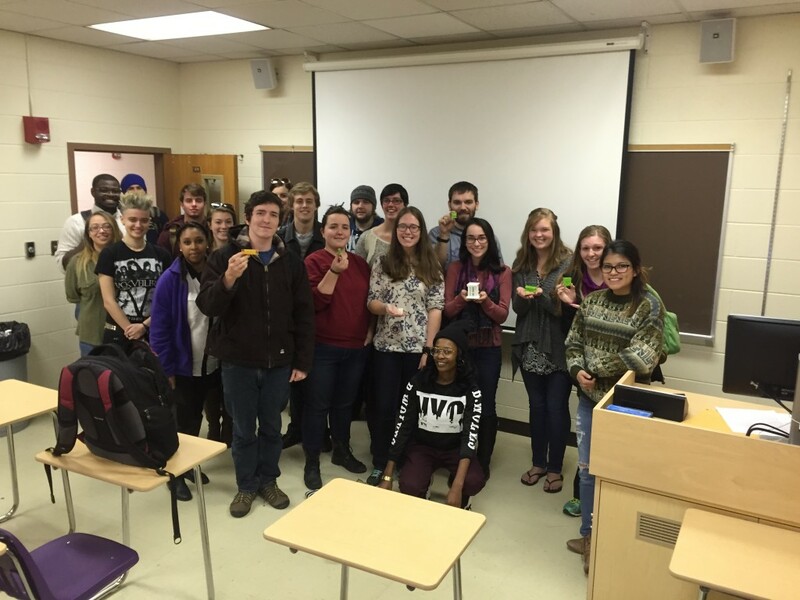 From the first class, a number of skeptical students stayed enrolled specifically in order to learn 3D printing. One of the great joys of the semester was listening to their excitement during our first 3SPACE training session as they talked with one another about plans for their own future projects, dreaming up new ideas for fun things they could print, both personal and academic. Students were actively dreaming of new ways that 3D printing might be beneficial for archaeological use such as creating new comparative collections of animal bones for zooarchaeologists, making artifacts from museum collections more widely available for indigenous peoples who approve their distribution, teaching stratigraphy by printing each layer of an excavation separately, reconstructing features or just simply allowing the public to inspect a reproduction of an artifact up close in a way that might damage the original. 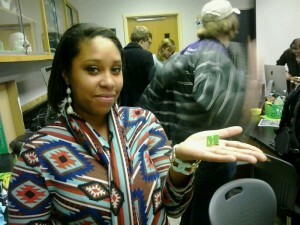 Carlisa Childress shows off her first 3D printed object, a JMU logo. Perhaps the most important question is—was there an actual educational benefit to incorporating 3D printing into the class (other than that it was fun)? Did the students understand the intellectual connection between 3D printing, Daesh’s cultural heritage destruction and the reproduction of memory? As the museum exhibition artist Gary Staab recently said in a Smithsonian Magazine article that described an exhibition model in which he combined his own sculpting with 3D printing to recreate the Neolithic mummy known as Ötzi, “I also find the physical act of making stuff is such a great memory aid. If you want to learn something, you draw it. If you want to know it, you sculpt it. If you have to physically make it in three-dimensions, that burns it into your memory and those facts stay hard and fast,” (Wei-Haas 2016). Three-D printable objects are mnemonic devices, acting as tactile, visceral, ontological connections to their progenitors while also incorporating something new: the labor of the student who reproduces, remembers, touches and observes these objects, physical phantoms of their former selves. The student physically contributes to their memory and reproduction, and it is this, I think, that makes them powerful tools not only in the classroom but as a global tool for fighting the kind of destruction promulgated by Daesh. With 3D printing, memory of sites and objects isn’t just widely distributed, observed, studied and remembered; it has to be actively physically reproduced with time, materials and labor. Each act of reproduction individually chips away just a tiny bit at the destructive force that obliterated Version 1.0, empowering the maker, the memory and the other globally-distributed reproducers. Ömür Harmanşah (2015) points out that Daesh’s destruction isn’t just iconoclasm; it is more like reality TV, an ever-escalating attempt to grab the world’s attention by enacting The Unthinkable. This also humiliates populations whose pride is intertwined with protecting and remembering local monuments in front of a global audience, like schoolyard bullies who tease those they perceive as weak in front of their peers. Like schoolyard bullies, the best way to shut down aggressors is for everyone, united, to join together in opposition, to respect and remember the individuals, sites and objects they attempt to desecrate, both ancient and modern. Obviously our priorities today must fall firmly on the living people who are suffering the deprivations of warfare and occupation; but it’s important, too, to remember that the value of these sites and objects doesn’t really lie in their physical remains. It lies in the fact that this is all we have to remember the dead, to remember the acts of past peoples—workers and kings, everyday families, mothers and children, farmers, travelers and priests—real human beings whose lives are commemorated only by the tactile remains they crafted. Daesh attempts to destroy the honor of the living and the memory of the dead through these acts but the resilience, persistence and memory of the living people of Syria and Iraq is stronger than their oppressors. Allahyari, Morehshin. “Material Speculation: ISIS (Work in Progress).” 2015. Accessed 02/22/2016. http://www.morehshin.com/2015/05/25/material-speculation-isis/. Harmanşah, Ömür. “ISIS, Heritage, and the Spectacles of Destruction in the Global Media.” Near Eastern Archaeology, Vol. 78, No. 3, Special Issue: The Cultural Heritage Crisis in the Middle East (September 2015): 170-177. Wei-Haas, Maya. “An Artist Creates a Detailed Replica of Ötzi, the 5,300-Year-Old ‘Iceman’.”_ Smithsonian Magazine_, February 17, 2016. Accessed 02/22/2016. http://po.st/gy5vhe. Cite this post: Jennifer Grayburn. “Teaching Archaeology of the Middle East in the Time of Daesh: the Merits of Incorporating Allahyari’s “Material Speculation” with 3D Printing”. Published March 02, 2016. https://scholarslab.lib.virginia.edu/blog/teaching-archaeology-of-the-middle-east-in-the-time-of-daesh-the-merits-of-incorporating-allahyaris-material-speculation-with-3d-printing/. Accessed on .